Family-oriented Rapids Water Park is located in Riviera Beach in South Florida, and it offers many of the same attractions as Florida's more celebrated water parks like Orlando's Wet and Wild. There''s something here to entertain visitors of all ages, so plan to spend a least a full day if you want to experience all this park has to offer. Rapids Water Park offers a total of 29 rides water slides, some wild and some mild, and some especially for kids. Here are a few of the best. Big Thunder: Rapids claims this is the largest water ride in all of Florida. This four-person tube ride takes you down as fast as 20 miles per hour. A big funnel spins riders around and then down the tubes. One reviewer simply described it as "really high and really fast." Body Blasters: This ride features 1,000 feet of darkness that riders plunge through. The dips, curves, turns and drops really make this attraction a fun, although heart-pounding, adventure. Black Thunder: This water ride is another of Rapids claims to fame. One of many thrilled reviewers on Yelp said it was "Amazing! Grab three friends, hop in the four-leaf clover raft, and pray that you aren't the one who ends up plunging backwards into the funnel." Raging Rapids: The Raging Rapids ride is a lot of fun, but it's not as treacherous as it may seem. In fact, one reviewer stated that it is "a great wild family raft ride." This ride seats up to four riders and sends them down two sharp drops before they hit the rapids. Tubin' Tornadoes: Yet another of Rapids' more exciting rides, Tubin' Tornadoes takes you down a 1,000-foot tunnel in the dark. There are numerous turns and twists before you land in the water. For visitors that may want to enjoy Rapids Water Park without all of the apprehension that comes with riding some of its wilder attractions, fear not. The park offers a few less thrilling, but never-the-less entertaining attractions. 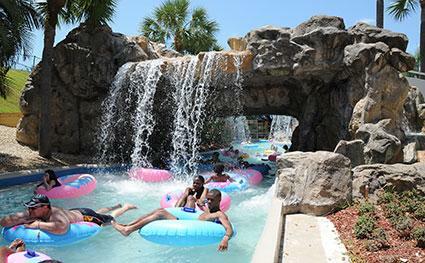 You can always take it easy at the Lazy River, which is always a family favorite. According to one reviewer, "They have the best Lazy River." Another reviewer states that "The lazy river is a great way to get from one side of the park to the other or to chill out while your heart rate returns to normal after a sudden plunge." To access the Lazy River, all you need to do is grab a tube and float along for a slow moving quarter mile. If you arrive at an attraction you like the look of you are are free to hop off and try it out. Waterfalls and rain forests keep you wet. Big Surf is another option. This wave pool spans 25,000 square feet. The waves can reach up to six feet, but the pool is much gentler at the shallow end, so it makes a nice place to hang out and relax until you're ready for some more thrills. In addition to these rides, Rapids also offers several options for the younger children. Alligator Alley - This is a fun ride designed specifically for kids under 10. Climb across netting, walk through the swap and spray water everywhere. 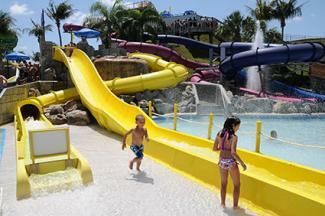 Splish Splash Lagoon - The lagoon includes water slides, water-shooting cannons, and a shipwreck kids cab explore. Tadpool - This wading pool is available for toddlers. Small slides and floating swamp animals make this area a lot of fun. Rapids Water Park offers a full day's worth of enjoyment for the entire family. Before you pack up your beach towel and head out for this Florida water park, there are a few more things in mind. There are two full service snack bars located in the park. You may not bring food or drinks into the park. Food includes American fare, such as hamburgers, hot dogs and pizza. If you want to bring your own food you can use one of their picnic areas located just outside the park gates. Ice cream and other novelties are available throughout the park. Some rides do have height and weight restrictions on them. You can learn this information from guest services, or check the map. The park is operational from March through October, weather permitting. Hours are limited in March, September and October. The park will not issue refunds or rain checks in the event of bad weather, and they will close the rides depending on safety and weather conditions. Before you make a trip to Rapids, visit their official website. You can purchase tickets, get directions and check out the operating schedule for the day you plan to visit. Discounts may also be available, particularly during the week and especially for Florida residents.